somehow i like the idea of using Calamansi instead on cherry tomato.. looks as if she is holding a giant lollipop. cute. I really admire your cutting until now. The beef shank with spices, is that similar to Rendang? Looks very yummy! @Angeleyes : Thanks a lot Alice! 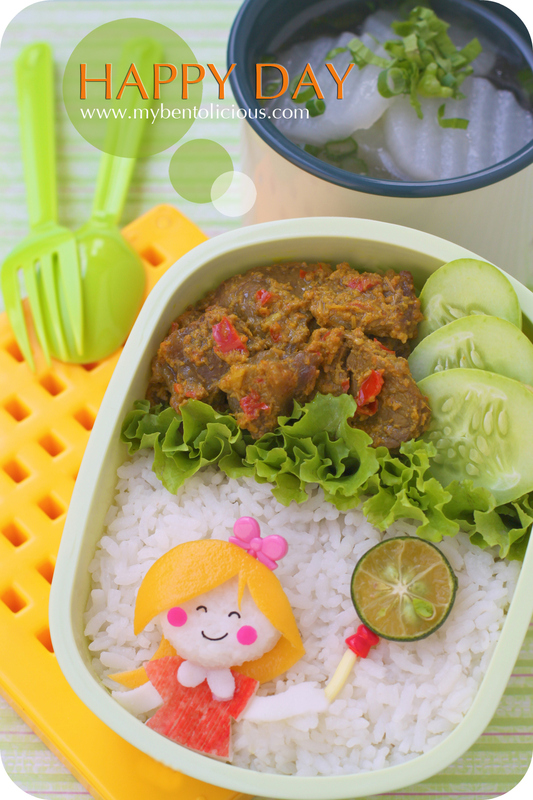 You give me an idea to make a wind mill bento for tomorrow, yeay!! I think it's awesome! I love the balloon :) The other thing that struck me is that the little girl's hair is 3D! Too cool! @ღᏓуռ էяɨռɨאღ : Thanks a lot Lyn for your sweet comment! That is so adorable! I think I prefer this to a red tomato balloon. I too admire your cutting and bento skills Lia! lia, what does calamansi taste like? looks like a small lime maybe? The girl is so cute!!! You have calamansi tree at your back yard?? owh how cool is that!!! and is that soto Bandung you made?? yumm yumm my favorite!!! Creative and delicious, you have a bento style and talent like no other, Lia! I love how you've styled the calamansi into a buoyant balloon! So cute and fun! Love your happy girl! I love the cute little girl..you're so amazing! aww can't believe it. I missed this cute one :D..